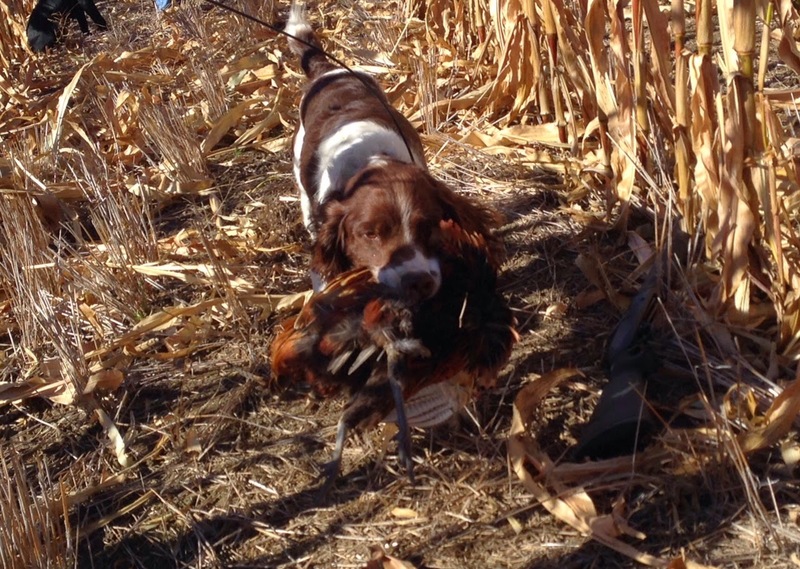 A Bird Hunter's Thoughts: South Dakota 2014 Opener, Or: Road Hunters, It's a Family Tradition! 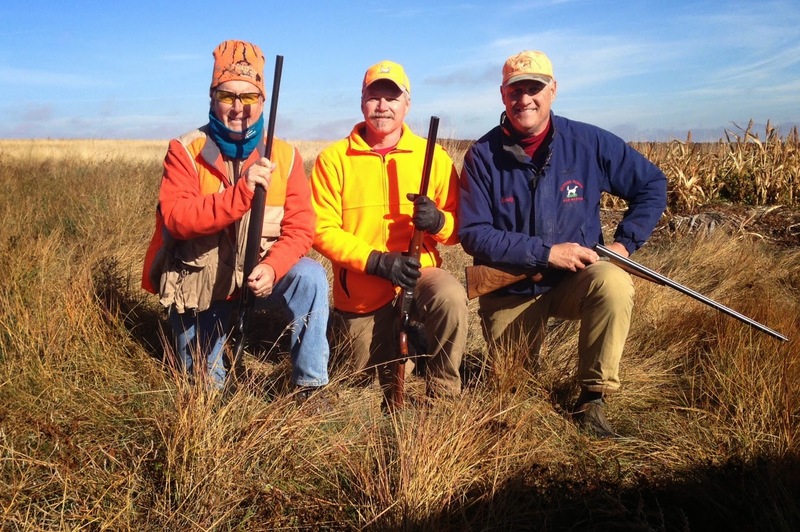 South Dakota 2014 Opener, Or: Road Hunters, It's a Family Tradition! At the last minute, I loaded up my Jones trailer, which can hold everything I own, hooked it up to the back of the Beast and headed out to Pierre, SD for Opening Day of pheasant season. I know there are hunting rituals all over the country- deer opener, grouse opener, and, for the masochistic maniacs, the Chukar Opener. But, the pheasant Opener in South Dakota is a BIG DEAL. I found that out when I called to ask about a room at any motel I could find. The Super 8 in Pierre had rooms and was reasonably priced. The all-pavement, parking location left something to be desired when dealing with 6 dogs, but, after all, this was a last minute thing. We arrived Friday (Opener was Saturday) and quickly headed to the National Grasslands south of Pierre to search for Sharptail Grouse and Prairie Chickens. It's a vast, undulating sea of grass. The birds are there, but, today so were the hunters. In fact, we saw several outfits of hunters camping in the Grasslands- who knows how long they'd been there? By the time we arrived, our areas had been hunted several times, I'm sure. We did get close to a Prairie rattler coming out of a Prairie Dog hole, but that's about all the wildlife we saw that day. The next day, we got up early and headed out of town to some Hunter Walk-in Areas. We found a few likely areas, parked and proceeded to spend 2 hours waiting for the noon opening time to hunt pheasant. (After the first week, it changes to 10am for the rest of the season.) Our chosen area was snuggled in between two huge fields of standing corn. The day would warm up fast, so we knew the birds would probably stay in the corn all day- there was no reason for the birds to go back in to the CRP grass where we could hunt them. But, we managed to find a few stupid ones still in the grass and we had some success. In fact, we also saw Prairie Chickens in the same CRP field. Shack and his first pheasant pointed and retrieved! Over the next two days, we jumped around some and ended up on some private land over near Okaton (west of Pierre). We saw a lot more action as the dogs spent some time chasing the ditch chickens and got the idea of how to hold them. Shack, above, went in some tall grass and his Alpha beeped me. He was pointed! I took a few steps and several roosters came out of the tall grass. Most of them made it to safety. One dropped back in the grass and I yelled, "Dead bird, Shack!" I still couldn't see him for the tall grass, but just a few seconds later, he came bounding out of the tall grass with a rooster in is mouth. It was beating him with wings and trying to spur him. He sprinted to me and handed the bird over. Then, he headed back out to the grass and more birds. He will be a good one. Ace, my main dog, took to a long ditch full of cattails. He and a Lab hunted up and down along the sides and pushed in to the center a few times. After about 10 minutes, I noticed the noise stopped from his pushing around in the brush. Then, I heard the pager from my Garmin Alpha (don't leave home without it!) and checked the direction and range. I made it to him, pointed into some of the thickest stuff yet. He was locked solidly with the countenance I know from almost ten years of hunting over him. There was a bird....right there! I kicked and stomped and got nothing, but Ace was staunch, swearing to it. I kicked and stomped some more and the cattails moved off to Ace's left and finally 2 roosters took off for the standing corn. I dropped one solidly and Ace took off for the retrieve. He's an old pro and not much gets away from him, anymore. Shack and Rick and I were working a CRP field that bordered a gravel road. It was about an hour before dark. Across the road was standing corn. 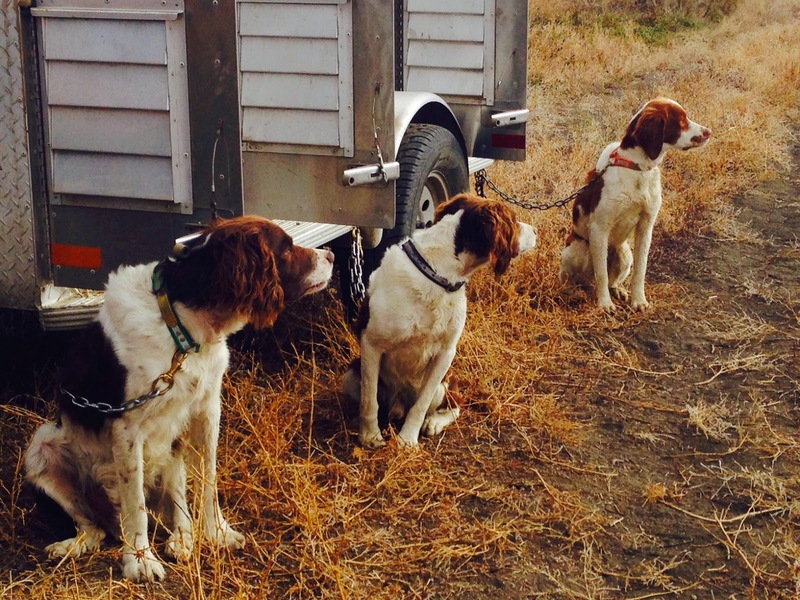 Most pheasant hunters will see the ideal setup to trap a few roosters in the CRP. We were working into the wind, as well (what a concept! It seems we are always hunting with the wind up our backs.). All the planets seemed to have aligned! Shack just found his first bird and made a fantastic retrieve and were were edging down the field anticipating more action ahead of us, along the road. A truck came down the gravel road and passed us. He got maybe 1/3 mile past us and stomped on the brakes, slid to a stop, and all four doors opened and four individuals with shotguns jumped out, ran in to the CRP field and started shooting! Birds flew and dropped and people ran to pick them up, got in the truck and drove off. I was a bit chagrined! I mentioned it to my hunting partner and we agreed they were a bunch of jerks. We kept working the same direction, letting the dog work. About 10 minutes later, it happened again! Different truck, same place. The birds must have been crossing from the corn to the CRP right there. I was, by now, amazed at the lack of ethical behavior by these ....hunters! We turned back to the truck and talked about other things. 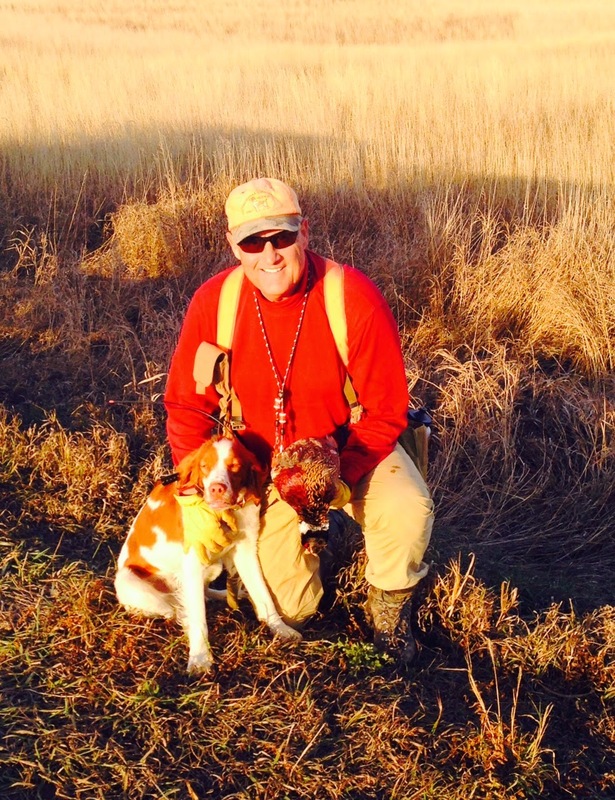 A short, but great trip for learning and busting up pheasant. To drive a day and a half, hunt 3 and half days, then drive a day and a half home, is tough on this old body, anymore. I enjoyed Pierre thoroughly. The Grasslands need some study, but they are impressive! The public land hunting is adequate, but very crowded on opening weekend. I think the better time to hit the roosters would be in November or even December. Don't worry about numbers going down, hunters cannot harvest enough to make significant reduction. What previous hunters will do, however, is make the birds smarter and more wary....but that's why they call it hunting!